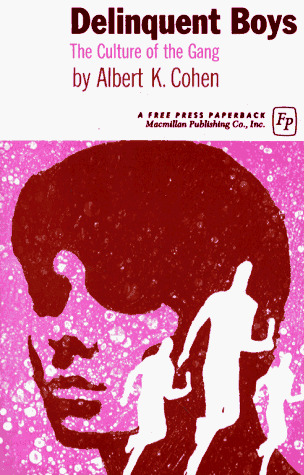 In 1955 Albert K. Cohen wrote Delinquent Boys. He attempted to look at how such a subculture began. Cohen found that delinquency among youths was more prevalent among lower class males and the most common form of this was the juvenile gang. Cohen, a student of Sutherland and Merton, learned from Sutherland that differential association and cultural transmission of criminal norms led to criminal behavior, while Merton taught him about structurally induced strain. Delinquent subcultures, according to Cohen, have values that are in opposition to those of the dominant culture. These subcultures emerge in the slums of some of the nation's largest cities. Often, they are rooted in class differentials, parental aspirations and school standards. Cohen notes that the position of one's family in the social structure determines the problems the child will later face in life. Thus, they will experience status frustration and strain and adapt into either a corner boy, college boy, or a delinquent boy. Corner boys lead a conventional lifestyle, making the best of a bad situation. They spend most of their time with peers and receive peer support in group activities. These boys are far and few between. Their chances for success are limited. Cohen argues that their academic and social handicaps prevent them from living up to middle-class standards. Delinquent boys, on the other hand, band together to define status. Their delinquent acts serve no real purpose. They often discard or destroy what they have stolen. Their acts are random and are directed at people and property. They are a short-run hedonistic subculture with no planning. They often act on impulse, often without consideration for the future. Members are loyal to one another and allow no one to restrain their behavior. Stealing, in the delinquent gang, serves as a form of achieving peer status within the group, with no other motive. Cohen declared that all children seek social status, but not everyone can compete for it in the same way. Reaction-formation, a Freudian defense mechanism, serves to overcome anxiety, as a hostile overreaction to middle class values can occur. A delinquent subculture is created to resolve problems of lower-class status.